BRUNSWICK - Patrick Alexander Doiron, 97, died Tuesday, Jan. 22, 2019, at Mid Coast Hospital in Brunswick. BRUNSWICK – Patrick Alexander Doiron, 97, died Tuesday, Jan. 22, 2019, at Mid Coast Hospital in Brunswick. He was born in Rogersville, New Brunswick, Canada, on Oct. 20, 1921, the youngest of 14 children of Placide and Marie (Bourque) Doiron. He came to the United States as a young child with his family. His early education was in Jay and Chisholm, Maine schools. He was fortunate to receive scholarships to attend junior high and high school at boarding schools in Massachusetts, graduating from Assumption Prep School in 1942. 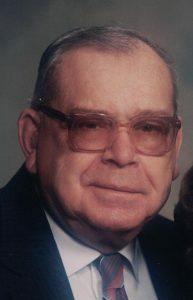 In November 1942, he was drafted into the U.S. Army and served primarily in artillery and communication units. He landed in France in January of 1945, advanced through Belgium and Holland, and was in Germany for Victory in Europe Day. He had met Violet L. Beaudoin before he left to serve in World War II. In August of 1945, he returned from his service in Europe and surprised Violet with a visit after borrowing $10 from a buddy for train fare to Brunswick. They were married on June 10, 1946, at St. John the Baptist Catholic Church in Brunswick. After living for a few years in Jay, Maine, and working in a paper mill, he decided to move to Brunswick with Violet and their young son, Bob. In 1951, he began working at Bath Iron Works. In 1953, they purchased a home on McIntosh Street in Brunswick, where he was fortunate to reside until the end of his life. He retired from Bath Iron Works after 35 years in 1986. He was a communicant of All Saints Parish. He was an enthusiastic fan of the Boston Celtics, as well as the Red Sox and Patriots. He never passed up opportunities to shout coaching advice at the television during their games. In October of 2016, he proudly participated in an Honor Flight Maine trip to Washington, D.C. with fellow Veterans. He was a wonderful husband, father, and man – a kind and generous soul – who will be greatly missed by those he leaves behind. He was predeceased by all 13 of his siblings, living the longest of any of them at 97 years, 3-months and 2-days. He was also predeceased by his wife, Violet; and a daughter, Lorraine R. Theriault. Surviving are his children, a son, Robert A. and his wife, Connie of South Portland; a son, Paul R. of Brunswick, and a son, Daniel P. of Brunswick; five grandchildren, Kelly Nason, Tim Doiron, Darcy Petrarca, Jonathan Doiron, and Jenny Doiron; five great-grandchildren, Taylor Aiken, Rachel Petrarca, Katie Nason, Alex Doiron, and Abbie Nason; and many nieces and nephews. Visiting hours will be from 5-8 p.m., Friday, Jan. 25, 2019, at Brackett Funeral Home, 29 Federal St., Brunswick. A Mass of Christian burial will be celebrated at 11 a.m., Saturday, Jan. 26, 2019, at St. Charles Borromeo Catholic Church, 132 McKeen St., Brunswick. A note of condolence or a memory may be shared at www.brackettfuneralhome.com.